1.First up, grab the latest Oculus Unity Utilities and Touch integration. This stuff is still evolving so to avoid errors and snags, make sure you're up to date. See the ReadMe file in the OvrTouch folder for these points and more info. 2.In your project, once the Touch sample package is imported, bring in the Touch prefabs and connect up the right and left hand anchors. You can find the prefabs in the OvrTouch/Content/Hands/ folder. Select the prefabs one at a time and drag the appropriate HandAnchor transform to the Touch Anchor field on the prefab. 3. To prevent odd movement glitches and update issues, it's recommended that you parent the hand prefabs into the PlayerController hierarchy, preferably under the camera coordinate space. Under the TrackingSpace node seems to work well for me. 4. Set: Edit->Project Settings->Time->Fixed Timestep = 0.01111111 to reduce judder and hand tracking latency. 5. Don't forget to try the sample scenes in the OvrTouch/Content folder. OvrTouchDemo and TapeMeasure in particular for a taste of the haptics capability. These hands come from a blender model created by SuperDasil: http://www.blendswap.com/blends/view/81285 licensed under the Creative Commons. I have remodeled them a bit to match the Oculus touch sample joint proportions and capped the ends to be a little more pleasing to the eye. Should updated Oculus Touch samples come along with significant changes I can update these to match. 7. Finally you'll want to grab things in your own project huh. Items you wish to interact with need to be rigidBody physics objects which means you'll want to setup the usual components required for that. This may also mean you need to set up colliders etc so your objects don't fall through the floor when you put them down [or throw them for fun]. Simply add the supplied Grabbable.cs script [OvrTouch/Script/Hands/] to your object and you should be good to go. That should get you up and running. If anyone else has useful info to share please do, the more the merrier. I have these implemented into "Drifting in VR" already. Work well! I like this thread, so I made it an announcement. Hi, I was trying to modify these hand meshes in Blender (add gloves), then export them again as fbx files and use those in a Unity project. But the importing and exporting of the fbx files breaks the armature and bone weights. So could you maybe release export-ready blender files of these hands, so artists can modify or replace the models without breaking anything? That would be fantastic. @JulianB That's a real shame. I'll keep trying and report back in case I succeed. Thanks for the reply. Thanks for the post, the fixed timestep is news to me! I'm going to try this one out. Is there an option i'm not seeing to force objects to snap to a pose when you pick them up, regardless of their orientation when you grab them (or, as I imagine, is this outside the scope of the Grabbable functionality)? That is outside of the scope. However you could make a class to either add to the object, or inherits grabbable and setup a pos and rotate vector for pickup. I have done this for items like swords etc so it places itself in the hand by default. From there the player can actually grab it with the other hand and adjust as needed. where can i find Unity touch sample packages? i can't find it in oculus download page. Thank you for taking the time for this! VERY appreciated! Because i don't have a OvrTouch/Content/Hands/Models folder. 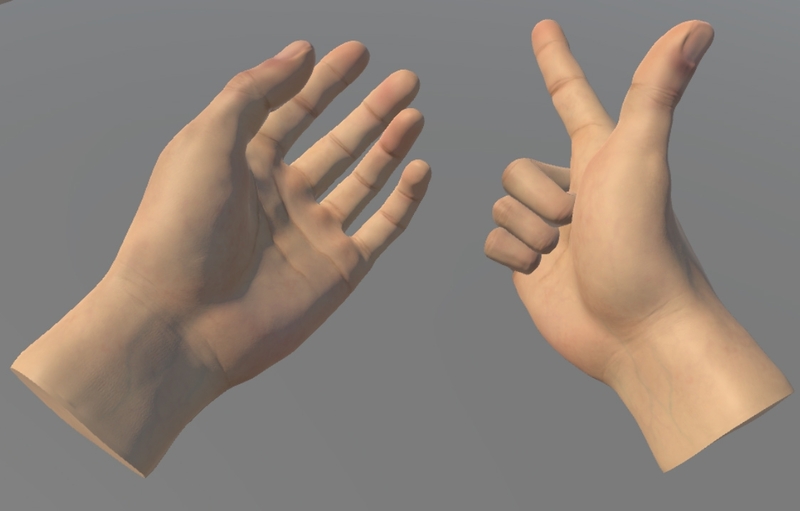 Also, the mesh now gets created when starting an application for the normal hand models. So there is nothing to drag those things onto in the editor.